Medical Coatings and Deposition Technologies is an important new addition to the libraries of medical device designers and manufacturers. Coatings enable the properties of the surface of a device to be controlled independently from the underlying bulk properties; they are often critical to the performance of the device and their use is rapidly growing. 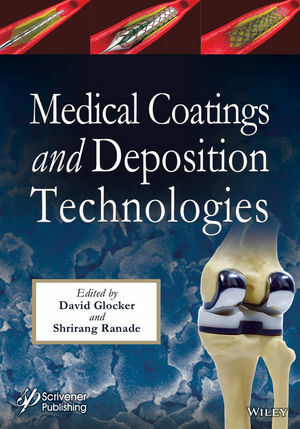 This book provides an introduction to many of the most important types of coatings used on modern medical devices as well as descriptions of the techniques by which they are applied and methods for testing their efficacy. Developers of new medical devices and those responsible for producing them will find it an important reference when deciding if a particular functionality can be provided by a coating and what limitations may apply in a given application. Written as a practical guide and containing many specific coating examples and a large number of references for further reading, the book will also be useful to students in materials science & engineering with an interest in medical devices. Chapters on antimicrobial coatings as well as coatings for biocompatibility, drug delivery, radiopacity and hardness are supported by chapters describing key liquid coating processes, plasma-based processes and chemical vapor deposition. Many types of coatings can be applied by more than one technique and the reader will learn the tradeoffs given the relevant design, manufacturing and economic constraints. The chapter on regulatory considerations provides important perspectives regarding the marketing of these coatings and medical devices. Dr. David Glocker has worked in the fields of thin film deposition and plasma treatment for over 35 years. He spent fourteen years at the Eastman Kodak Company, where he led a group responsible for research on PVD coatings and coating processes and methods for the plasma modification of polymers. In 1993 he founded Isoflux Incorporated to manufacture cylindrical magnetron sputtering cathodes and develop coating processes employing that technology. Several medical device manufacturers now use Isoflux cathodes and related patents in both research and manufacturing. Dr. Glocker is an inventor or co-inventor on 32 US patents as well as a number of foreign counterparts and is the author of numerous articles and presentations. He recently retired from Isoflux and consults. Dr. Shrirang Ranade, Technical Development Leader at Genentech, Inc., a member of the Roche Group, has spent over 15 years working within large medical device and Pharma (F. Hoffman-La Roche, Johnson & Johnson and Boston Scientific) in the field of biomaterials, coatings and drug delivery devices. He obtained a Bachelor of Engineering from the University of Poona, a Master of Science from the University of Manchester Institute of Science & Technology and later a Ph.D. in Polymer Science from the University of Connecticut. Through his career he has been involved in research and development of medical devices for combination products in several forms: coronary drug eluting stents, balloon catheters, sinuplasty devices, orthopaedic scaffolds, biodegradable coatings and lately an implantable ocular drug delivery system.